When you sign a contract you assume you’ll only have to pay what’s written in the agreement. 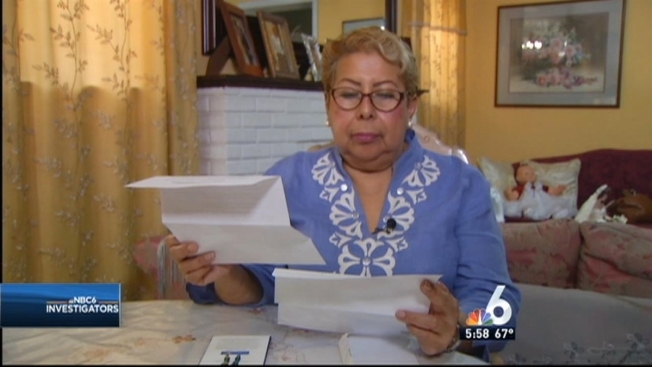 But Cecilia Abadie, a Miami resident, says that’s not what happened to her when she agreed to pay $2,000 for a cure to what she calls an embarrassing problem that she’s been hiding in her shoes for years. But the cure hasn’t come quickly for Abadie and now she’s being told to pay more. “My goal was I wanted my toenails to be clean, to be without illnesses,” said Abadie. Abadie said she thought she had done everything right when she signed a contract which outlined the terms of her laser therapy. But then, she says, she was told to cough up more cash to continue the treatment, something she thinks isn’t fair. Abadie said advertising for the nail laser treatment helped convince her that podiatrist Gary Small had the answer. She says she was also confident that she was making the right investment based on the doctor’s reassurances. “He told me himself that it would take at least between six to twelve months for my toenails to be cured,” said Abadie. The contract, which was written in Spanish, says that the $2,000 laser treatment would last up to a year but also states that the treatment would continue until the fungus disappeared. Abadie said she went for treatment religiously for almost three years but the problem never went away. Now she says, she’s being asked to pay $50 a visit if she wants to continue. “I believe she shouldn’t have to pay more in this particular case,” said healthcare attorney Rafael Gaitan, who reviewed the contract. “We’re not talking about fraud here but I think it was misleading in the fact that the treatment was going to be guaranteed, yet it had a finite or an end date as to when the treatment would end,” said Gaitan. Small declined NBC 6's request for an on-camera interview and said he was no longer the owner of the practice and just an employee. He said he cares about his patients and referred NBC 6 to the new owner. She said the $50 charges would only apply to laser treatments, something the new owner said is no longer covered by the contract and hasn’t been effective. She also said the practice would provide Abadie other treatments at no charge until they resolve the problem as a measure of good faith. To help avoid these types of disputes, Gaitan recommends paying for treatment with a credit card so you can challenge charges if there are problems. Gaitan said if you don’t think a practice has lived up to its part of the contract, take detailed notes and express concerns to a provider as soon as it happens. And if you don’t have an attorney to review a contract Gaitan suggests sitting on it for 24 hours, share it with those you trust to make sure it’s a document you really want to sign. Abadie said she’s excited to start her treatment again, which will likely mean pills or creams. The attorney NBC 6 spoke to said when you can’t reach an agreement in cases like these, you can take your complaints to small claims court and reach out to the state medical boards.